74-Year-Old Woman Violently Assaults Two Texas DPS Troopers – Really? An activist was watching State Senator Wendy Davis filibuster an abortion bill in the Texas Legislature when two Texas DPS Troopers approached her and told her to come with them. (Note: Although they are troopers, they are also known as Capitol Police, and function more as security guards than as peace officers). According to the Probable Cause Affidavit, the Lt. Governor order that the gallery be cleared and the Troopers were enforcing that order. When they got to Martha Northington and told her to leave, there was a problem. According to the arrest affidavit, Northington resisted by grabbing her seat. Unfortunately for the Trooper, the scene was being videotaped. At 0:02 in the video, you can clearly see Northington reach down to pick up her purse and newspaper. Almost immediately after this the Trooper on her right grabs her arm and you hear Northington protest that he’s hurting her. You can see that the black Trooper is not concerned by her picking up the purse, but the white officer has a death grip on her right wrist. Then, at the top of the steps, the Trooper avers that Northington struck him with an open palm. Really? Funny, it doesn’t appear in the video. Plus, since the Trooper has her right wrist and her left hand is holding a purse (which was not dropped), it would be kind of difficult for her to hit him with an open palm. You can see the purse clearly in this photo. Northington was apparently originally charged with Assault on a Public Servant, a third degree felony, but the arraigning magistrate reduced the charges to Resisting Arrest and Assault by Contact, Class A and Class C misdemeanors, respectively. Northington was sent to the hospital due to pain in her arm. According to one report, the Trooper had difficulty filling out his report at the Travis County Jail. That is a typical problem when the arrest is not actually for a crime, but for Contempt of Cop. In addition, state troopers tend to have an attitude that requires their directions to be obeyed without question or hesitation, and they tend to get irritated if they perceive that someone is not moving fast enough. Finally, troopers are extremely reluctant to admit that they made a mistake, as they perceive that as a sign of weakness. In any event, it is easy to look at this and determine what happened. The Trooper did not think that this little old lady was moving quickly enough and decided to yank her out of her chair even as she was gathering her belongings. Once she challenged him (“you’re hurting me”) he likely decided that she needed to be shown her place and be arrested. This led to the charges. If you look at Northington’s arms, it is fairly clear as to who used force, and it wasn’t the little old lady. Again, there are problems with this. According to the arrest affidavit, she resisted arrest by grabbing her seat. OK, even if we give the trooper the benefit of the doubt, if she is resisting arrest, there has to be an underlying charge. What was she being arrested for in the first place? Second, any assault on a peace officer is a felony, even if that is just by contact (i.e., an offensive touch). Without video, it is the trooper’s word against the suspect. Here, Northington supposedly slapped the trooper with an open hand. Yet the black trooper does not make a move to help the trooper who was just “assaulted” by Northington. I’ve been in those situations where an officer gets slapped. Every officer that is there immediately jumps in to control the suspect when that happens. That did not happen here, and is indicative of a COC arrest. As I mentioned, troopers do not like to be questioned on their actions or authority. An old video shows the same attitude with another trooper asking for identification from a journalist. In that case, a senior trooper had the good sense not to allow any arrest or other action to take place, but the attitude is clear. It is a how dare you question my authority attitude. Really? I don’t know about you, but I expect that troopers will not make arrests for COC and will not put false information in arrest affidavits. I’m not real keen on little old ladies being manhandled either. that police use to arrest people when there is no actual crime. OK, the officer lied on the report. Nothing new, it’s a justification for the arrest beyond “a 72 year-old woman didn’t move fast enough”, and he embellished it with an open palm strike (known as a slap to a male violating a an old woman, but it didn’t happen). The problem is two-fold: If she was resisting by holding on to the seat, his lie put that into question; second, his lie put into question do we know the truth of what a cop says without the video. There are too many videos out there that contradict police reports to believe police reports=facts or truth. This is something good cops need to take head on, not by making the videos inaccessible, but by realizing that these videos represent bad police work. They should grasp that without the video a bad cop punished an innocent. They should not accept that as just “it happens”. I think part of the problem lies in the fact that “good cops” are vastly outnumbered by the “bad cops”. Not that that is an adequate excuse. I think the conduct of our cops illustrates that our servants have become our masters. This will not end well for anyone. I don’t believe there are more bad cops than good. I don’t even take that on faith-belief. But we may have definitional problems here. I went through an on-line conversation with a good and honorable cop named “Ken” years ago and he gave reasons why good cops allow bad cops to exist so long as the bad cop doesn’t cross the line too far: “there but for the grace of God go I”; Brotherhood; and what happened to Serpico. It makes it tough. As for Brotherhood, ECLS touched on how his mind-set changed once he left police work. I’ll give what a Calculus professor said when I asked him if he was a member of the Libertarian Party: “no, I don’t belong to groups, once you join a group you identify with the group, and then you begin to lose your moral compass.” It’s a paraphrase from a long monolog about losing your ideals in order to belong to a group. No man would man-handle a 74 year-old woman without the patience of exhausting all other avenues. I agree with everything you posted except at 0:10-0:11 it appears that her left hand and purse strikes the right side of the officers face. Do you see that too or am I imagining it? It’s possible, but it doesn’t appear that way to me. For one thing, the trooper’s head doesn’t move at all, which would be normal if struck. The movement doesn’t even have to be from the force, merely moving something rapidly towards a persons face causes them to recoil as a protective instinct. Enough other posters say that they see her strike the trooper, so I’ll defer to them. I don’t see it clearly enough to be positive, but if she did, the trooper has PC to make the arrest. She could plead self-defense to excessive force, but I would focus on the resisting charge, when he first grabbed her. There still has to be an underlying ground for arrest to charge resisting. Actually..I stand corrected. The woman has a black notebook & it appears that she swatted him with it. Whether or not it’s intentional is another matter. But, it’s not her purse & she certainly didn’t get a slap in. Regardless, I was in error & so, I apologize. Having said that, I still believe that this shouldn’t have happened & that he had no right to hurt her. What a POS! I think we were talking about the same object – it looked to me to be a purse, but I could be wrong. In any event, I agree that the trooper’s actions were uncalled for. After seeing other videos featuring Texas DPS Troopers like Farrell and Helleson in action, seeing this happen at the Capital doesn’t surprise me. 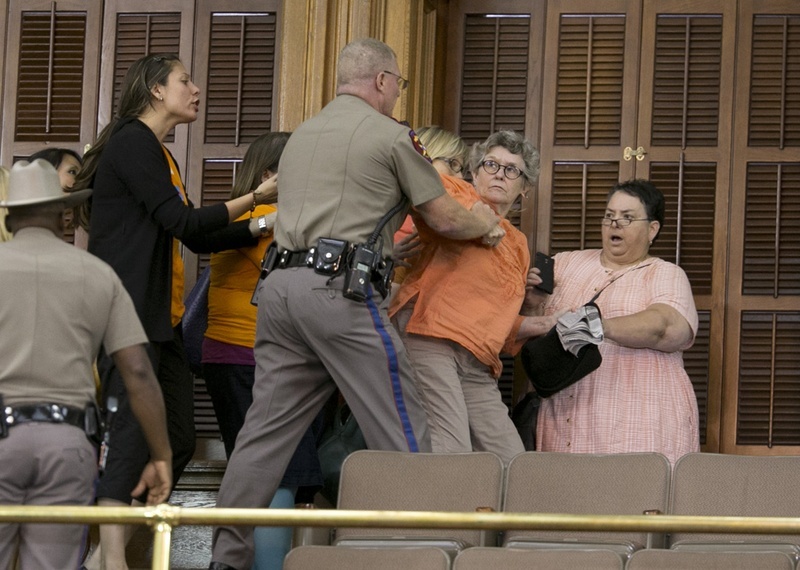 Before I watched this video, I thought it would be about the DPS beating or tasering this woman in front of everyone in the gallery to show who is in control. It looked to me she may have been trying to regain her balance going up the stairs while the cops were pushing/gripping her. Her arm made a sudden move while in the death grip of the DPS ape. I believe she is lucky the troopers didn’t beat her half to death when there were no cameras rolling. Contempt of cop can end in death in this day and time. The DPS has publicly shamed the citizens of Texas again. I pray that this vicious woman is tried and convicted and imprisoned for the safety of us all. One thing I have learned about policemen is they have carte blanche to lie and get away with it. Judges always come down on their side. Regardless of the taped evidence that the woman obviously did not assault the policeman, odds are pretty good the judge will still rule in the cop’s favor. I suspect there are good cops left in this country but as of late, I’ve begun to have serious doubts. Not many in my experience. Cops are such cowards! why don’t they go work at McDonald’s if they are going to piss their pants every time an elderly person or a child try to get rough with them. You must have watched a different video. There’s a difference between cowardice and abuse.